Tonight marks the first night of Hannukah, the Festival of Lights . While many of you may be familiar with the story of the Miracle of the Oil, what is frequently overlooked is that Hannukah celebrates another miracle - the miracle of a group of farmers and tradesman utterly defeating the professional armies of the Seleucid Empire, a victory for freedom that belongs to all of us alike, Jew and Gentile. Hanukkah celebrates one of the important miracles in Jewish history and reminds us of the triumph of faith. It takes place every year,usually in mid to late December. While its date varies if you go by the western calendar, in the Hebrew calendar Hanukkah always falls on the 25th day of Kislev. Hanukkah celebrates the victorious Jewish war for independence in the second century B.C. E. The story is told in the First Book of Maccabees, and retold in the Second Book of Maccabees. A contemporary military history of the war can be found in Battles of the Bible, coauthored by Chaim Herzog and Mordechai Gichon. After his death, Alexander the Great's empire broke into several parts, and Israel was under the control of the Seleucid empire, based in Syria. Israel had lived peacefully under the Persian Empire and under the Ptolemic empire (of Egypt), both which tolerated Judaism; but the Seleucid Emperor Antiochus Epiphanes was an arrogant, bigoted Hellenizer, who attempted to force the Jews to abandon their religion and to adopt the Seleucid's Greek customs and worship,which included idolatry. And his efforts were not without success in some quarters. There were those Jews who considered themselves `modern' and `assimilated' who were willing to go along with this, even to the extent of having surgical operations to reverse circumcision. Others did not, and they were prosecuted vigorously and brutalized by the Seleucid Greeks. The start of the Maccabean Revolt sprang from a single spontaneous act of resistance. In the foothills village of Modiin in 167BCE, a Greek army unit set up an altar, and ordered the local Jewish rabbi, Mattathias, to sacrifice a pig and eat it. He refused, as did his five sons. When a Jewish collaborator came forward to offer the sacrifice, a furious Mattathias "ran and killed him on the spot, killed the king's officer who was forcing them to sacrifice, and tore down the altar" (1 Mac. 2:15-25). Mattathias, his sons and their followers then headed for the Judean hills, to launch a guerrilla war. They were farmers who had no military training,fighting a professional army. There had not been a Jewish army since Babylon had destroyed the Judean kingdom four centuries before. Their only weapons were farming tools and whatever simple weapons they could construct, such as maces or slings. During this first year, Mattathias died, and his middle son Judah took over command as his successor. Nicknamed "the hammer" ("Maccabee," in Hebrew), Judah constructed a guerrilla army that staged daring nighttime raids on the Greek outposts, then melted back into the countryside. His successes attracted more supporters, and the revolt spread. The war went on for 25 years, one of the most singular wars for independence in history. The miracle, perhaps is that it was fought at all, let alone won. The Seleucids and Antiochus sent huge, well equipped armies into Israel to subdue the Jews. They were all defeated, at odds that seem miraculous even today. 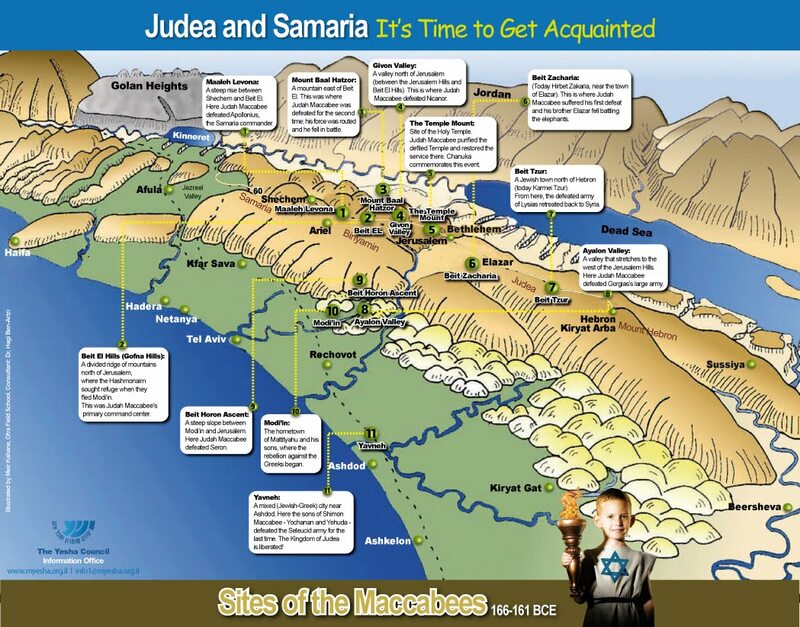 Judah Maccabee turned out to be a tactical genius, using unheard of tactics, leading the Greek phalanxes into the hills where they could not maneuver and destroying them. One thing that is seldom mentioned about the war is the fact that a significant part of it took place against the Hellenized, `modern',`assimilated' Jewish traitors I mentioned earlier, who were more than willing abandon the Jewish way of life and supported their Seleucid masters against their fellow Jews. As Ecclesiastes famously said in the Megillot, there's nothing new under the sun. In 164 BCE, the Jews defeated a force commanded by the Viceroy Lysias that outnumbered them two to one. That battle took place six miles north of Hebron, near the Jewish fortress of Beth-zur. The victory allowed Judah and his army to retake Jerusalem. When they entered Jerusalem, Judah and his followers entered the Holy Temple on the Temple Mount. The Temple had been wrecked and horribly desecrated, with profanities scrawled on the walls and the Ark by the Seleucids. 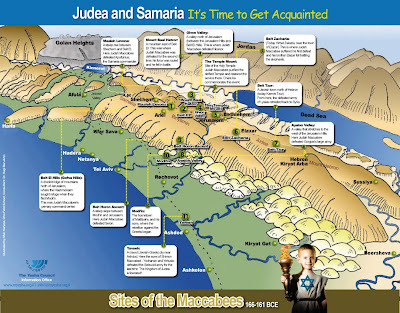 The Maccabees built a new altar. When the time came to light the N'er Tamid, the Eternal Light of the Temple, the Jews could find only one sanctified jar of oil marked with the seal of the High Priest. It was only enough to last one evening. On the 25th of Kislev, in the year 164 BCE,the lamp was lit with this small jar of oil and, miraculously, stayed lit for eight days, until more oil suitable for the temple was made. The eight days of Hanukkah celebrate that miracle, as well as the divine intervention that had led the Jews to amazing victories over well-equipped professional armies far superior in numbers. "Therefore, carrying ivy-wreathed wants and beautiful branches and also fronds of palm, they offered hymns of thanksgiving to Him who had given success to the purifying of His own holy place" (2 Mac. 10:7). The war itself continued. In 160 BCE, near modern-day Ramallah, Judah was killed, but Judah's brother Jonathan, and then his brother Simon took command of the Jewish army, finally winning complete independence in 142 BCE. At last, "All the people sat under their own vines and fig trees, and there was none to make them afraid" (1 Mac. 14:12). That verse, by the way, was the one quoted by George Washington in his famous letter to the Jewish congregation in Newport, Rhode Island's Truro synagogue, assuring them the the new American government welcomed them as citizens and countrymen. Considering the history of Jewish persecution and expulsion in Europe, that letter of welcome meant a great deal to the Jews of 1790. President Washington obviously was familiar with the Book of Maccabee, and knew exactly what that war was fought over. You see, the War of the Maccabees was the first war ever fought for religious freedom. Somehow, a group of farmers with no military training who refused to bow to their oppressors defeated a mighty empire and its immense standing armies. There seems to be no plausible explanation for the victory of the Jews except that it was a miracle...as was the American Revolution itself. Towards the end of the war, Antiochus and the Seleucids became so obsessed with defeating the Israelites that they sacked their own cities and sold their own citizens into slavery to get money to pursue the war against the Jews. The war bankrupted and destroyed their empire. Hanukkah reminds us that with G-d's help, victory over evil is assured, that light conquers darkness and no miracle is impossible. Modern Israel and the survival of the Jewish people against all odds are proof of that. Aside from the Hanukkiah (candlesticks), the other great symbol of Hanukkah are those small spinning tops known as dreidels. Forum: Is It Time For A Third Party? Our Weasel Of The Week!! !